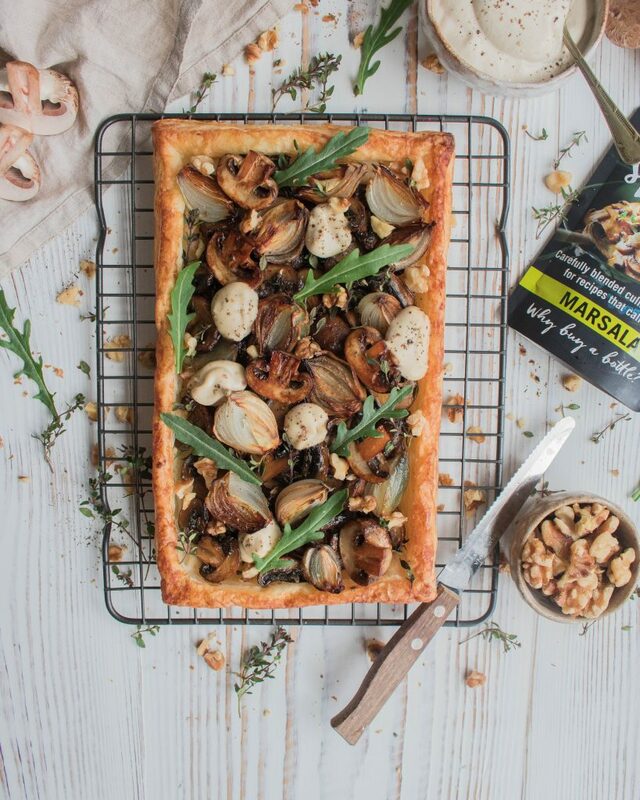 Nothing beats a flaky and golden puff pastry tart with some caramelised mushrooms and some creamy cashew cheese. This tart has been my latest obsession! I made it twice to make sure I got the flavours absolutely right and I served it once to Sam’s family and everybody totally loved it! 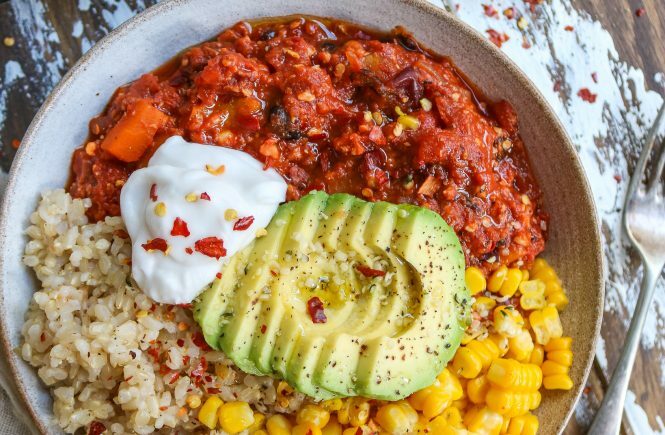 It’s definitely one of those dishes which are guaranteed to be a crowd pleaser as it’s filling, packed with different textures and super satisfying. 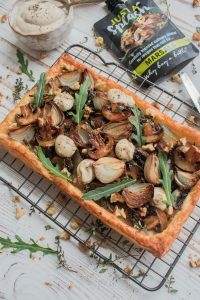 To add bags of flavours and take some pretty ordinary mushrooms to the next level I used Just a Splash Marsala wine which adds a lovely sweet and rich flavour and make the mushrooms go super caramelised and with a gorgeous golden shine. If you are concerned about the alcohol content of this dish please bear in mind that most of alcohol actually evaporates during the cooking procedure. What is left is a rich and intense flavour which will elevates any dish to another level of deliciousness. 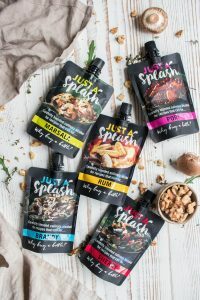 In case you are not familiar with Just A Splash, it is a NEW range of quality culinary alcohols in handy recipe-sized 100ml pouches, perfect for any sweet or savoury dish. Available in five variants of spirits and fortified wines: Rum, Marsala, Brandy, Sherry and Port. 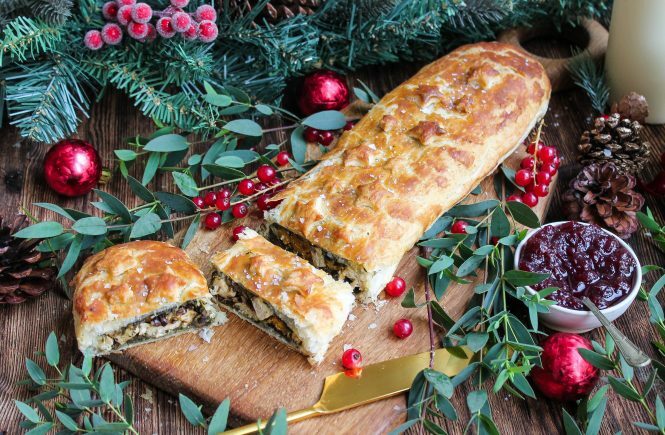 When your recipe calls for a little bit of alcohol, like a dash of brandy in a mushroom stroganoff, a drizzle of sherry in a trifle, or a swig of port to reduce your roasting juices, for the first time you don’t have to spend a fortune on a whole bottle! Just A Splash saves money, saves cupboard clutter, reduces waste. Start by making the cashew cheese (you can also make this the night before) Drain and rinse the cashews and place them in a blender with all the other ingredients. Blend until super smooth and creamy. Pour the cheese into a jar or container and place it in the fridge while you are making the rest. Place the shallots into a baking tray. Drizzle them with some olive oil, salt & pepper and roast them in the oven for 25 minutes until soft and golden brown. To cook the mushrooms add 1 tablespoon of oil to a pan with the crushed garlic. Cook it for 1 minute on low heat to prevent the garlic from burning. Add in the mushrooms, turn the heat up and cook them f0r 3-4 minutes until all the water has evaporated. Pour in the Just a Splash Marsala and let them cook for about 10 minutes until all liquid has evaporated and the mushrooms look glazed and caramelised. Sprinkle the thyme leaves and mix everything together. On a baking tray covered with parchment paper roll out the puff pastry. With a knife gently score a rough border, approximately 2cm from the edge. Prick over the middle with a fork leaving the border intact. Halfway cooking the shallots place the pastry in the oven and lightly cook for 8 minutes until it starts to puff up. 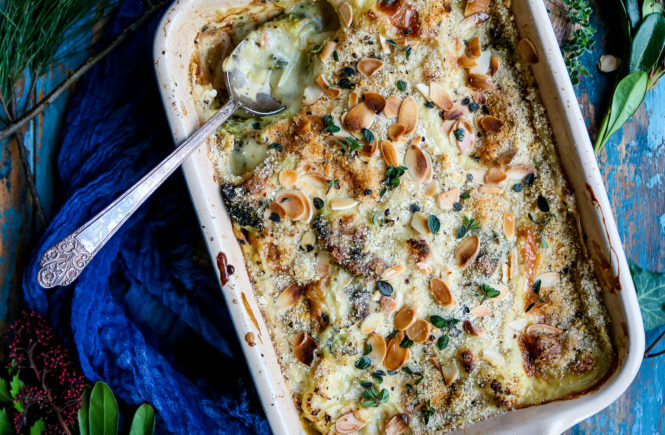 Remove tart and the shallot from the oven. 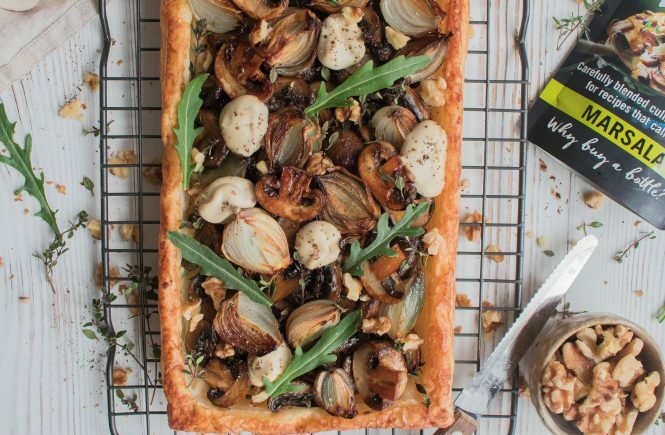 Gently add the mushrooms into the centre of the tart, alternate them with the shallot. Brush the edges off the tart with the pastry glaze. Place the tart back in the oven for another 10 minutes until beautifully golden brown. Serve the tart with the roughly chopped walnuts, rocket leaves and some dollops of cashew cheese. Enjoy!